OneNote is the note-taking-and-sharing application that's part of Microsoft Office. It lets you create notes by hand, as audio, or by clipping items from other electronic formats to create a file that can be indexed and searched. With the release of Office 2013, OneNote has been integrated with Windows 8-powered tablet platforms and offers advanced mobile-enhanced features. This guide includes all the basic information, guidance, and insight you need to take full advantage of everything OneNote can do for you. 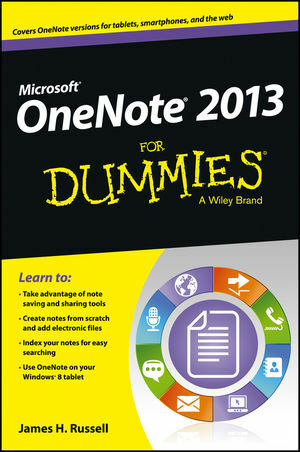 OneNote 2013 For Dummies gets you up and running with OneNote quickly and easily. James H. Russell is a technology writer and journalist who specializes in PC hardware and software, tablet computing, and social media. He writes for numerous online periodicals, and in 2012 Mashable.com named him one of 101 experts to follow on Google+.